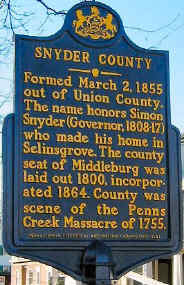 Snyder County was created from Union County on 2 March 1855. Any questions for me about the content or format of this web site? Let me know by emailing me. I can assist you in finding sources, but due the lack of time, I can only respond to lineage questions that are of my interest. However, my ultimate goal and desire is to help you find Snyder County sources, most of which are NOT on the Internet. For further information on using the Internet for responsible research, read the National Genealogical Society's Standards for Use of Technology In Genealogical Research. You're already here. Introductory information and synopses of each site section. This is the place to find transcriptions of original documents. The archives will contain abstracts of wills, deeds, cemetery transcriptions, etc. If you're interested in submitting to the archives, click on the link to the submission form, as there are several transcription projects occurring at this time, such as census, obituaries, wills, etc. The archives are totally dependent upon persons transcribing material and submitting it to the archivist for posting. A brief description of the Snyder County Historical Society, its holdings and how to access its wealth of information. A mailing list maintained for RootsWeb by Vanessa Argyres for people who like to network with one another on Snyder County history and genealogy. You can subscribe for free and receive either individual e-mail messages or a digest (bundle of e-mail messages) in your e-mail box. This is the place to post your queries. The RootsWeb Message Board bulletin board system maintained by Vanessa Argyres for queries and other genealogical submissions The forum is automatically indexed and searchable. A growing collection of links to sites related to Snyder County and Pennsylvania, Snyder County travel information and standard genealogical links. A basic secondary resource list for those researching the county, annotated and evaluated as to value. A list of communities and boroughs in Snyder County, past and present, with aliases, locations and GPS coordinates linked to the U.S. Bureau of Census Tiger Map Server. A jurisdictional history of the county, along with township and borough formation. Included are downloadable historical maps of the evolution and history of the county. Historical photographs, postcards, illustrations of areas around the county. A collection of historical maps relating to the County, each at different time periods. A brief history of the Snyder County Courthouse, its offices, what records it holds and how to search them. A listing of funerals homes in the greater Snyder County area which may have death records available for research, depending upon the discretion of the proprietor. A complete listing of all known cemeteries, aliases, borough or township of location, global positioning system (GPS) coordinates, with links to transcriptions and transcription projects. A map and list of each modern civil divisions of township and borough and antecedent townships in present-day Snyder County. Links to census transcription projects are provided. A listing of the older churches in the county and where to find their records not yet posted to the Internet. Information about soldiers serving and/or living in Snyder County in all wars. The page is undergoing extensive revision and consists mostly of Civil War soldiers at present. A brief history of major newspapers published in Snyder County's past, along with where to find microcopies or back issues. © by the Snyder County PAGenWeb. Unless indicated otherwise in a particular page carrying this copyright notice, permission to use, copy and distribute documents and related graphics delivered from this World Wide Web server (http://www.rootsweb.ancestry.com/~pasnyder/) for non-commercial uses is hereby granted, provided that the above copyright notice appears in all copies and that both that copyright notice and this permission notice appear. All other rights reserved. Snyder County PAGenWeb disclaims all warranties with regard to this information. The information described herein is provided as is without warranty of any kind, either express or implied.